Are you ready for a new homemade granola recipe? About time, right? Well, say hello to a simple and delicious granola with figs, coconut and crunchy nuts! It’s got almonds AND walnuts, cause they are my go-to granola nuts. Love them. And then there’s the coconut. Flaked natural coconut that gets all toasty in the oven. Plus a little spice, cause we want flavor here. So bring on the cinnamon, cardamom and vanilla. All of which are dreamy together with dried figs. And why dried figs? Well, they are packed with dietary fiber, which is important for healthy digestion and well after all those heavy foods at Christmas (or for others all of December), some of us need a little help getting our digestion system back on track. And that’d be my favorite Schwabe. Yes, this homemade granola recipe with figs was his request. Here you go darling! Granola is pretty much a stable breakfast food in North American. Something I grew up on. I guess you could say in Canada we ate granola (or cornflakes, cheerios and the like), while Germany at muesli for breakfast. 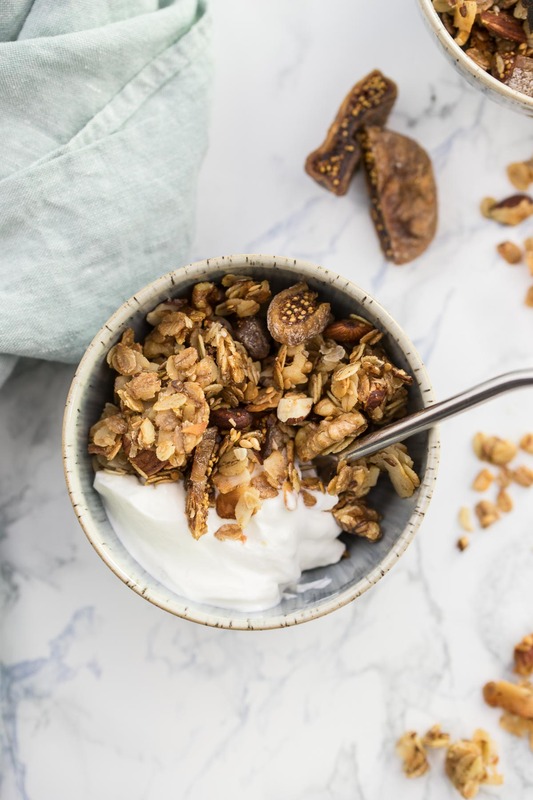 While both are made up of grains, nuts, seeds, and dried fruits, granola is actually baked along with a sweetener like honey or maple syrup, plus a plant-based oil which binds the ingredients together, making a crispy müsli. It’s enjoyed the same — with milk, with yoghurt or simply a handful as a snack (a trail mix so to say). 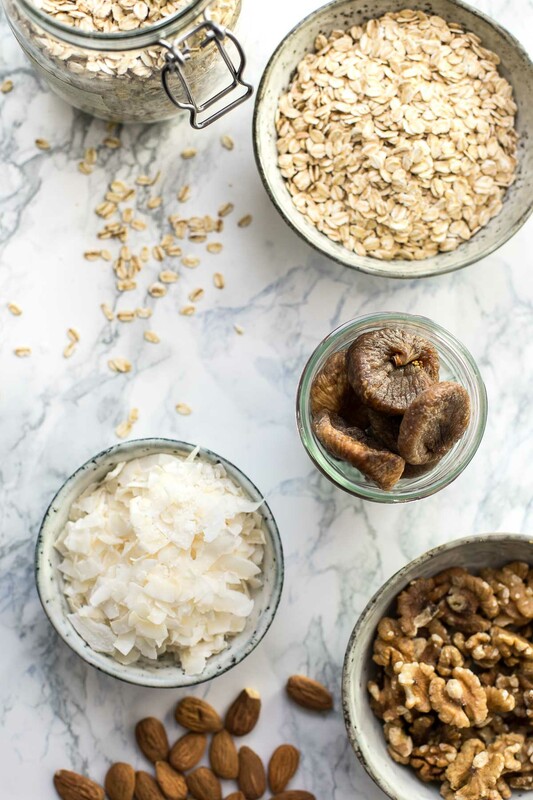 A basic granola recipe requires just a handful of ingredients: oats (I also like using 3-grain or 5-grain flakes), a sweetener (like honey or maple syrup), oil, and nuts or dried fruit (and maybe a little cinnamon). Pretty basic, I know! Yes, the formula is simple. To keep things easier, try to remember to use a 50:50 ratio of sweetener to oil. I use 125 ml of each in this recipe, but in other granola recipes I reduce the sweetener to 90 ml or 100 ml and the fat even a bit more. But since I was going for a classic crunchy granola, it was important to have just enough of both to create the perfect amount of crunch and clumping together. Speaking of clumps. For the best results… I’m talking good clumps, once the granola comes out of the oven, use a spatula to press down on the granola and then leave it in the pan, untouched, until it is completely cooled. It will harden, and then you can break it up into clumps. Important side note to ensure this granola recipe remains delicious! It’s really important that you add the dried fruit AFTER baking. Otherwise it will burn. And burnt granola tastes terrible! Which also brings me to “timing is everything”. The thing about granola is that you will know when it is done even before you look at the timer. It will be golden brown and the kitchen will be filled with a delicious and toasty aroma. For me it is all about the smell, within minutes, the granola transforms itself from being simply müsli to delicious aromatic granola. Aka crunchy müsli. Making granola at home not only ups the nutritional value (and flavor), but as you will discover, it’s just THAT easy and quick. It is far healthier than store-bought since it’s made with whole grains, unrefined oil and naturally sweetened. Read the ingredients, you’ll see what I mean! Make it vegan: I choose honey as I think it fits really well with the figs and spices, but feel free to sub it out with maple syrup. For more granola recipes, be sure to check out my archives. 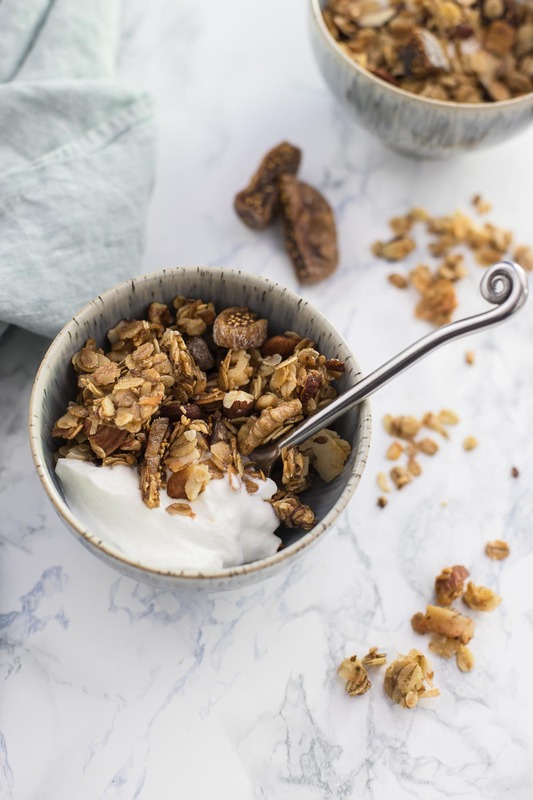 Simple, classic granola recipe infused with the tasty flavors of coconut, almonds, walnuts and figs. Naturally sweetened, and full of protein and fiber! The perfect breakfast or snack. Preheat the oven to 320°F/160°C and line a baking sheet with parchment paper. Mix the oats, nuts, cardamom, cinnamon, vanilla, salt and flaxseeds together in a large bowl. Stir to combine. Add the oil, and stir well to combine. Then the sweetener and stir again until everything is really well coated. Important: the dried fruit is added after baking the granola, as it burns easily. Turn the granola out onto the prepared pan and spread in an even layer. Bake until the mixture is golden brown and fragrant, about 20-25 minutes, stirring after 10 minutes to make sure the granola cooks evenly. Timing is important: As the granola cools, it firms up, so be sure not to wait until your granola has browned too heavily before pulling it out of the oven. Once your granola is finished baking, let it cool on the baking sheet (ca. 15 minutes). Once completely cooled, crumble the granola and stir in the dried fruit. Store in an airtight container at room temperature for 3 to 4 weeks or in the refrigerator for up to 6 weeks. Enjoy! For this recipe I either use old fashioned oats (also called rolled oats) or 5-grain flakes made from whole wheat, oats, barley, rye and whole grain rice. Instead of pure flaxseeds, I used a store-bought mix of "Leinsamen mit Pflaumen & Dattel" from my local organic food store. Acacia honey is may favorite choice for baking, as I like its sweet, floral flavor. This granola recipes yields enough to fill a 2.2 liter container. 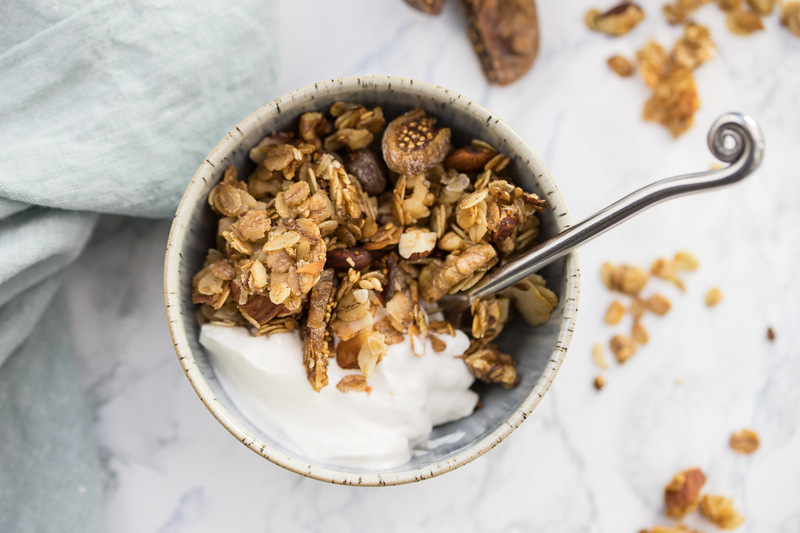 If you make this Granola Recipe with Figs, Coconut and Nuts, I’d love to hear how it turned out for you! Be sure to rate it and leave a comment below to let me know! Especially if you have tips for other readers. Or take a picture and tag me on Instagram @ellerepublic and don’t forget to hashtag #ellerepublic so I don’t miss it!